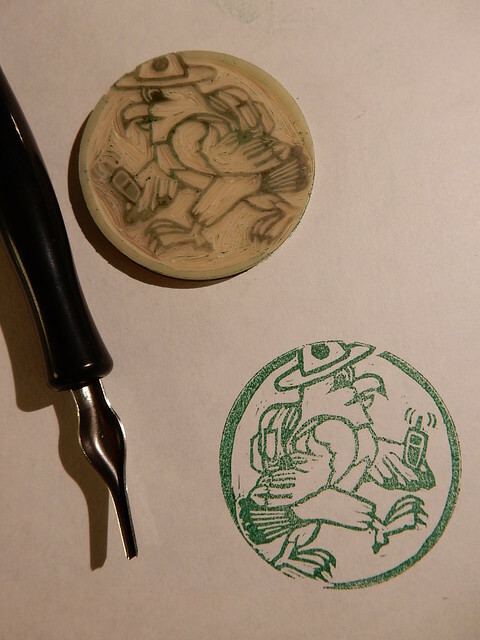 I needed an image to test out a new stamp carving material and decided to try carving Hank the Hawk (it's been on my to-do list anyway). This is the first inking of this stamp and it still needs a fair bit of work before I'll consider it complete. BTW the stamp is 1.75" is diameter, a bit on the small side. Thought some might be interested to see this; when complete I'll likely hide it and list it on OCNA and on AtlasQuest. Sorry local cachers for the spoiler. I think it looks great. I'm yet to carve my own stamp, but want to do so for my first letterbox planting.